If you arrive at work and notice there are creepy crawly bugs everywhere you look, it‘s time for an exterminator! 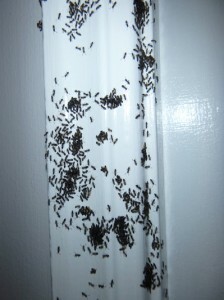 Bugs will distract employees and even cause some or most employees to refuse to enter the building. No employees equals no production and without production your business will be brought to a halt. Fortunately, Ecotech offers same day pest control for emergency situations with affordable prices and environmentally safe solutions. Pests not only detour your workers but they can also pose a serious threat to everyone’s health. As an employer or a building owner it is important to remove the problem before someone is negatively affected. Insect‘s carry bacteria like E coli and salmonella, some can cause allergies and all can contaminate food. Don’t let your office get that infested! Ecotech understands the risks and headaches a pest invasion can cause you, that’s why we are here for you day or night. Perhaps you stopped by the building to make sure it was locked up late at night or you came in before sunrise to get a project done in peace, regardless of the time you noticed the unwanted visitors, we are just a call away from exterminating today! It is your responsibility to keep all your workers safe, while they are on the clock. With our natural pest control solutions, we can guarantee safety for everyone in the facility, except the bugs. We do not use harmful chemicals that affect everything and everyone in the area. Because there is not one solution best for every pest problem, we will identify the problem, advice a solution tailored to your extermination needs and also help you with prevention. We can make this a onetime treatment or we can come out for routine inspections. If you are experiencing a pest infestation at your place of business, call Ecotech today at 763-785-1414. If you need emergency pest control NOW, call our 24/7 phone line at 612-237-8282! Your pest problem will be a thing of the past with the pest management professionals at Ecotech.